Sometime ago, hubby & I were invited to the OpenRice Cooking Event At De Dietrich. The Cooking Demo was hosted by Chef Tadashi Takahashi of Hashi Japanese Restaurant. The Salmon Sashimi With Japanese Shiso Sauce was one of the dishes we learnt that day, & I'm more than happy to share it with you today. Shiso (紫蘇) is an Asian culinary herb commonly used in the Japanese cuisine. The special sauce, concocted by Chef Takahashi, is a refreshing twist to the usual Wasabi often accompanying the raw fish. Chef Takahashi taught the audience how to prepare the Sashimi from scratch. I'd the privilege of understudying him on the art of slicing the perfect Sashimi. And you can learn how to prepare too, by watching the clip below. Have fun! Mix shiso sauce ingredients together. 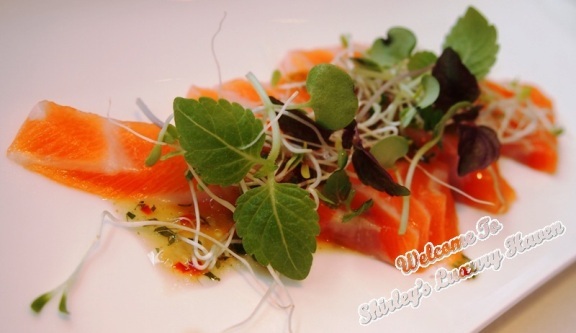 Drizzle shiso sauce on Sashimi & top with Shiso Cress & Alfalfa. Enjoy! That sauce sure looks tasty. i'm no fan of sashimi, but this looks interesting. Perhaps some day i may pick up the courage to put it into my mouth. Metzelder, looks cool huh?? Hahaha! You did absolutely a great job and love the outcome. The salmon looks so fresh and paired wonderfully with the rest, making it so appealing and making me drool at the same time. Nava, I was really nervous in front of a crowd. Lol! I thought they use cured salmon and not raw. I was thinking to try this some day now I am not sure if it is raw. Balvinder, sashimi are fresh raw meat or fish. U gotta try, my dear! Mr Lonely, thks for the visit! I am not too fond of sea food but it would have been so exciting to learn under a masterful chef! The presentation is beautiful! What a lovely dish! It's so fun to be able to learn hands on how to prepare it. Shirley, you did a wonderful job! Well Done! I don't think I can find those leaves here. Maybe I have to use other leaves :D Thanks very much for sharing. By the way, I really have a great time using the NuStevia. I received more today, different ones, to try. I will be hosting a giveaway soon.....my first ever :D Thanks very much again for the giveaway and for informing me! Mary, u've been making a lot of stuff with Stevia. Great that u're enjoying the products! Congrats, I'm really happy for u! Bessie, it was a great privilege! Great job! I would get stage fright and froze if I were the one out there, lol! I love the look of the sauce, different from the usual wasabi that comes with sashimi. Ken, I was wondering why it was so difficult for me to slice the fillet there. Then I realized that I was slicing from the left side of the fillet instead of the normal way that people would cut/slice their meat etc from the right side. Lol! The salmon sashimi looks fab! What a wonderful experience you had there, Shirley! Tina, been a while since we last chatted. Great having u here again. Thks, dear! CJ, thks dear! Enjoy your weekend! Beautiful pictures, Shirley! The dish looks awesome! And to think you were directed by a chef!! Wow! Also good to see your picture with your hubby...and thanks for stopping by the other day. Kanak, thanks so much for your kind note! Yap, it was certainly a delightful experience!